Wholesale Easter candy makes creating Easter baskets and Easter gifts so much more affordable. 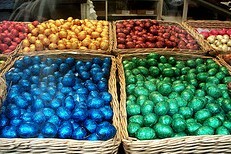 If you are looking for wholesale Easter chocolate, I can tell you where I shop and who has the best prices. I often find I need to buy Easter candy in bulk because I have to organize little treats for my nieces and nephews, my Sunday School class, and our local nursing home residents. The good thing about buying in bulk is that you generally save money. I use wholesale candy at Easter to fill Easter baskets for the family. For other groups, I get little favor bags from the local dollar store or online from Candyland Crafts. Favor bags are so inexpensive, but some really cute ones are available. This means you can give an adorable little bag of sweets that will bring a smile to many faces, but won't hurt your pocketbook too badly. Candy Warehouse - an amazing range of candy of all descriptions, not just chocolate. Candy Crate - a huge range to choose from for fillers. Dan's Chocolates - wholesale boxed chocolates if you need something a bit more special for adults. (These are great for business clients or club members, etc.). I hope you find some wholesale candy this Easter that suits your needs perfectly. Have a very Happy Easter!